Last month, Samsung has released a record-setting 30TB SSD, at that time rival claims to the throne. Even though the world has so many new record holders for the largest solid state drive (SSD), and it comes with 100TB storage space. The Nimbus Data ExaDrive DC100 is considered as a new, massive drive being tested with a selected customer and will become available for purchase. Moreover, around 20 million songs available (if you assume each file is 5MB) in a particular small device to fit in your home desktop. Therefore, in the upcoming section, we are going to discuss world’s largest SSD capacity at 100 TB in a detailed manner. As you may suppose, this is meant for a Server where storage space will have a priority over everything else and also including its performance which is around 500MB/sec speed. The data center will hold 100 PB (petabytes) of data in one rack instead of requiring large server room space. That will be really helpful for cloud computing services, artificial intelligence (AI) and other types of technologies that may need huge amounts of data. Furthermore, many companies say the Nimbus Data ExaDrive DC100 i.e. world’s largest SSD drive can use 3D NAND flash memory that will provide enough capacity to store 20 million songs (if people still download music), or 20,000 HD movies, and capable to read or write speeds of 500MB/s. Also, Nimbus Data is a fully guaranteed drive without any restriction, so if the most expensive drive kicks a bucket during that period of time you tried to get it replaced. How Nimbus Data Becomes Better than Others? The SSD is capable of sustaining throughput rates of up to 500 MBps can also write a gigabyte of data every 2 seconds, or 30GB data usage per minute. However, when the SSD or HHD is not capable to write a complete drive of data in a short time frame. Then, Nimbus Data has made some improvement in NAND flash memory reliability, even it may discard a metric that may not make sense if still applied to its own massive products. When world’s largest SSD drive Nimbus Data ExaDrive DC100 will ship in the summer, it will have prices when compared to other enterprise-grade SSDs “on per terabyte basis.” That means its cost will be probably in ten thousands of dollars, which is fair enough to give pause to several companies and they can afford it. When the drive must be reliable or trustworthy, in case, if one has gone bad then, your data will be lost and also lose a lot of money. Nimbus Data claims that an ExaDrive DC100 will consume 85 percent less power per TB (nearly 0.1W). There are few implications that a device hits a low power target by emphasizing capacity rather than the sheer speed. Apart from the Seagate and Samsung hardware, an ExaDrive can utilize both conventional SATA and Serial Attached SCSI (SAS ) as well. Often these massive hard drives, they were not targeted at consumers, but they have a glimpse into the near future that may permit us to never think to free up some storage space on our computer system. Nowadays, everyone wants to keep their crucial data in hard drive. Earlier, Samsung launched a 30TB SSD, but it cannot store much data in it. Thus, Nimbus Data ExaDrive DC100 is the world’s largest SSD drive at 100TB which saves so many HD movies or songs and other items as well. It is capable enough to read and write speeds in the 500MB/s range. Therefore, in this blog, we have discussed a detailed information about Nimbus data. 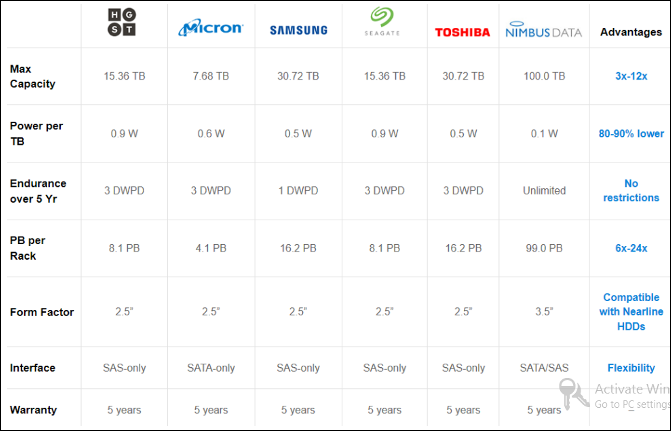 Also, we have mentioned the difference between Nimbus data and other SSD drives in a proper way.